Check out this year's route! What is Brody’s BUDDY™ Ride? 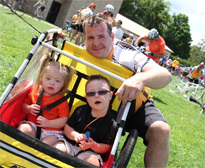 Brody’s BUDDY™ Ride is a 63 mile bike ride signifying Trisomy-21. With Down syndrome, it is the 21st chromosome of which 3 are three copies, hence 21 x 3 to equal 63 miles. It is here that we feel, 3 copies of the chromosome, as opposed to the typical 2, is better…”More is Better”! 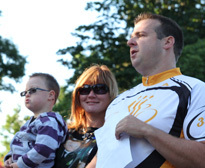 The ride and the event which follows was established to raise awareness for Down syndrome. The ride will start and end at the VFW in Clinton school where parking will be available for bikers, well as for the festival following the return of the riders.. The tenth annual Brody’s BUDDY™ Ride will take place on August 18, 2018. It has been established in honor of Brody Majka Savicki, as well as other children and adults who have Down syndrome. It is held on the third Saturday of August. Why was Brody’s BUDDY™ Ride Established? Brody was born on October 2, 2008, and what should have been the most joyous day for us, turned out to be one filled with fear and tears of sadness and disappointment. Due to our lack of education and lack of awareness regarding Down syndrome. We were worried about the years to come for Brody and his acceptance in this world, as well as for ourselves, now being faced with raising a child with special needs. We were scared of the unknown. Not only did we not know that people with Down syndrome have an increased risk for certain medical conditions such as congenital heart defects, respiratory and hearing problems, Alzheimer's disease, childhood leukemia, and thyroid conditions, but in turn, we were also unaware that many of these conditions are now treatable, so most people with Down syndrome can lead healthy, fulfilling lives. This proved true to us, as Brody underwent open heart surgery at 5 1/2 months old to correct his own heart defect, and has recovered amazingly! Following his birth, once the shock of this news became a reality, we fell completely and totally in love with our special gift, Brody, and we feel so blessed and honored that we were chosen to be his parents!! However, had we been more educated and aware of Down syndrome, our initial fears may have been nonexistent, and our special day may have turned out much differently. We have established this bike ride to raise funds for the Brody Savicki Foundation, in turn raising awareness for Down syndrome. Our hope is to educate people on the UP side of DOWN, and to help people realize how normal people with Down syndrome really are. When couples are given the news that their newborn baby has Down syndrome, we hope that they will experience all the joy and tears of happiness that should come with welcoming your new child into your world. be able to chase and achieve their dreams, and our goal is to be able to assist in any way possible. Down syndrome is a disability: a disability that does not define one, and one that does not stand in one’s way.